Should I send holiday cards? Yep, that’s the question! Think about what gives you joy during the holidays. Narrow it down to a few activities that are the most meaningful to you. 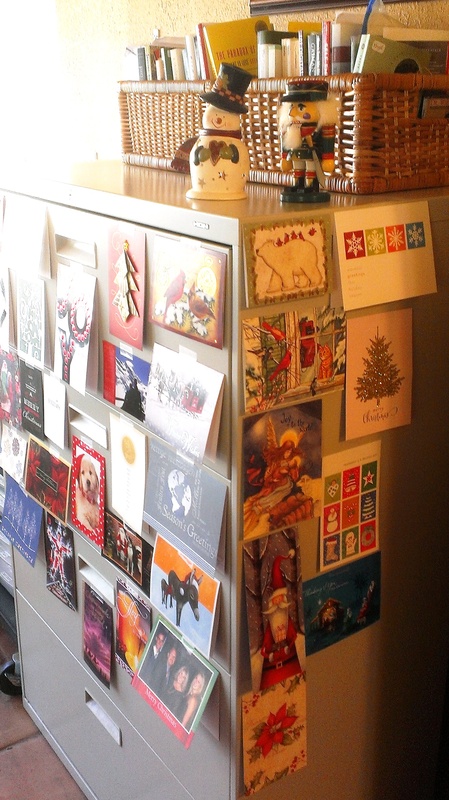 Does your short list include sending holiday cards? Now consider this: How much do you enjoy receiving them, and staying in touch with loved ones? Keep in mind that the fewer you send, the fewer you are also likely to receive over time. I love both sending and receiving holiday cards. However, if it will help de-stress your holidays, I say let it go! Guilt-free! Still, things happen. I don’t always get the cards sent, or not right away, or not to everyone I intended. I do use SendOutCards, the online service — featuring my own handwriting font and signature — but I still can’t bear to send the same card, with a canned greeting, to every single person on my list, with one touch of a button, as advertised. I have different things I want to say to different people: my clients; friends I see in person frequently; old friends who live far away; business colleagues; etc. So it takes me longer than you might think. Fortunately, I believe it’s never too soon, or too late, to let someone know you are thinking of them. One way of spreading out the love, the gratitude, and the work involved, is to send them in batches throughout the season – Thanksgiving, Christmas, and New Year, for example. If you miss the season altogether, there’s always Valentine’s Day! How Many? How Much? What Kind? Can’t afford to send cards to everyone you know? Well, you have two choices: 1) prioritize your list and send to only the truly most important people in your life, or 2) find cheaper ways to do it. I spend around $1.50 on each card, including postage. And I know hundreds of people, so not everyone gets a card. But for the ones who do, I think of it as a tiny little gift, not an obligation. In order of preference here’s what I like to receive: Cards that include gift cards (lol! ); handmade cards; paper cards with handwritten personal notes; photo cards (I prefer the ones of the whole family to the ones of just the kids); paper cards that I can display, maybe keep, or make little boxes and gift tags out of. Pre-printed cards without even a signature are less personal, but least I know you’re still alive, busy, and trying to simplify card sending! Newsletters are always welcome. The cheapest, of course, in terms of both time and money, are e-cards, e-mails, and social media greetings. I can’t decorate with them, but it’s always nice to know someone thought of me! I personally love the salutations “Season’s Greetings” and “Happy Holidays”, not because they are politically correct, but because they refer to ALL of the winter holidays collectively (for me, Thanksgiving thru New Year). I am more likely to say “Merry Christmas” or “Happy New Year” the closer we get to those actual days. If you are Jewish and want to wish me a “Happy Hanukkah”, I will simply be grateful that you are wishing me well! The word “holiday”, after all, does originally mean “holy day”. Does it really matter which one? If a project like sending holiday cards seems overwhelming, but you really do still want to do it, just break it down into smaller tasks and do them over several days: list recipients, obtain addresses, choose cards, address envelopes, write greetings, stamp and mail. Breaking it down like that also makes it easier to delegate steps to others in your family. I say have fun with it — don’t forget the wine, snacks, and music! — or don’t do it at all. It’s OK. Really. So…I’m curious…are you sending holiday cards this year? Or not? Do you enjoy receiving them? How do you display them, if you do? Copyright 2012-2016 by Hazel Thornton, Organized For Life. Yes I’m definitely sending cards but this year might be just family. My biggest obstacle is the card itself. I want a photo card of my kids and dogs but coordinating that photo is a nightmare. Thanks for all the great tips. Maybe allowing myself to send a not-so-perfect picture would relieve some of my holiday cards stress and guilt too! Jenifer, forget the dogs! (Not because they aren’t family members, but to reduce stress.) You’ve got some awesome photos of your kids already on Facebook you could use. (Although I prefer the whole family.) Or, like you said, go for not-so-perfect. Imperfect has its charms when it comes to photos! I love sending and receiving cards, but I have a hard time fitting it in. Guess I need to decide whether it’s a big enough priority to keep it on my list – thanks for the nudge! Hi Janet! Don’t forget you can keep the activity, if you enjoy it, but downsize or simplify it. While I am huge facebook fan, and love keeping in touch electronically with people throughout the year, there is nothing that tops the feeling of receiving a Christmas card in the mail. What a treasure. Whether it’s a family photo, a simple card with a handwritten signature or a jam-packed family Christmas letter, they all are like little gifts in my mailbox. It’s a blessing to know that my son and I are on someone’s list, someone’s mind, someone’s heart. Whether it’s sending out 12 or 120, there has got to be someone who would love to hear from you this time of year. Happy Holidays! Well said, Fay, that’s how I feel too — “little gifts in my mailbox”! Admiring the display of cards I’ve received is another form of counting my blessings. Thanks for your comment, and for being one of the inspirations for my post! I am trying to give the gift of time and presence. When we travel to one side of our family for the holidays we sent a Ham for dinner to the other family, so we are contributing to their family meal. When we give a present it is a shared experience, like roller skating, or a football watching party together. I just hope I have enough time to share with those for whom I care. These are great clutter free gift ideas, Lisa! I think that’s an excellent plan! Let me know how it goes. That’s a fantastic idea. People will probably appreciate receiving your cards even more when it’s sent when it’s not an occasion. What a great decision tree (no pun intended) that you offer us around sending holiday cards or not. For years we sent them…LOTS of them, as my parents had done before me. It was what you did…part of the holiday tradition. And as you said, a perfect time of year to let people know you were thinking of them. However, in the last bunch of years, we’ve opted not to send cards. Instead I keep in touch using various ways throughout the year…sometimes handwritten notes, sometimes via email, text, phone or in person. But for now, the card sending tradition has been halted. As most of my family is overseas I usually send cards with updated photos of our son. Last year was the first year ever I didn’t send any, I simply ran out of time. I have heard from a few people that they would be just as happy to hear from me on FB or by phone. Now that my son is old enough to be on FB himself the photo updates are not as important. I think I will just be sending cards to those not on social media. Facebook does kind of throw a wrench into the holiday card scenario, doesn’t it? Makes it easier to not send cards, and maybe less necessary. But it’s also less personal, and who knows which of your friends the FB algorithm will decide to bless with it in their news feeds, and you can’t decorate or do crafts with FB greetings! Sounds like you’ve hit on a good plan for yourself, though, Jill. I used to send holiday cards to my family and friends but over the years I found that I just didn’t have the time. I would rather keep in touch with everyone through out the year. However, I do send holiday cards to some of my clients. I like to touch base with them by sending cards and notes through out the year. Love the idea of breaking the card task into pieces. I do this and find that the task never feels too overwhelming this way. It is a principle that is helpful for so many large projects! Love this Hazel! I am a BIG fan of not living by the “shoulds” in life and making your own traditions and habits that work for you. I love the idea JoyfulSurrounds had to send a few throughout the year. I did something similar in the past. Sending New Years cards because I felt there was less mayhem at that time for the receiver and it aligned better with my business messaging for those clients attempting to set goals for the new year. Hi Erica! For business I, too, am a fan of the New Years card (getting the year started right), as well as the Thanksgiving card (grateful for your business, enjoy working with you)! I LOVE, LOVE, LOVE sending and receiving cards. I send birthday cards, anniversary cards, just ’cause I was thinking of you cards and definitely holiday cards. I usually buy boxes of cards well in advance. Last year, I found someone selling hundreds of boxes of holiday cards and was able to buy probably 25 boxes (3-5 of each type) at a great price so I have those packed away in the garage. I pulled out 4 boxes this weekend to start ours for 2015. My daughter is home from college for the Thanksgiving weekend so she is working on writing in the ones she wants to so we don’t have to wait until she’s home again for xmas to send out our cards. We get fewer and fewer cards in the mail every year so in some ways those become more meaningful. I’m a card sender. I used to send cards for every holiday, but since having my son I’ve scaled back to just Christmas and I don’t feel guilty about it! I usually just do the photo cards of my little guy, but you made me think I should include a shot of all of us. Is there a reason you prefer the family picture as to just the kiddos? Yes! The reason is that YOU are my friend, not your kids. I am happy for you, and I know you are proud of your kids, and I agree that they are adorable, and it’s fun to see them grow up, but I can see all of that in a family photo as well. (Is that why people don’t do it? they think it has to be a formal, professional portrait? It doesn’t have to be. It could be more than one candid shots, one of which includes you.) If we are close enough (in relationship and proximity) they might grow up to be my friends too. But, especially if we are not close in proximity, I want to see how YOU are doing, and what YOU look like these days. Have you cut your hair? Do you look happy? How much do your children resemble you, or not? (Easier to tell side by side.) Etc. Maybe I just want to recognize you if I come for a visit! LOL! Great post Hazel. I have missed sending cards a few years and I always think cards in January to keep in touch when things were less hectic seemed ideal. In reality, I actually try to return a card when I get one. That way the people that think it is important enough to send me one get one back. I always write notes in them. I love being able to respond to what they sent me immediately too. I personally feel lunch bag let down when I open cards from people I rarely see and there are only their names signed. I suppose some people send cards out of a feeling of obligation (so don’t put much effort into it), or they feel at a loss the it comes to what to write, but I, too, would rather see a note inside! Thanks for discussing about sending holiday card. It was intresting to read this post because you have raised some interesting points here and those are very little known to most of us. the blog is absolutely fantastic. I think it’s useful for many those who are looking for such info, keep it up.! My husband and I love sending out Holiday cards. We are a mixed Jewish and Christian family, so we use a seasons greetings type message. Usually, we write a one page letter to go with our card, which is always a photo card. We print the addresses on labels using a Word document with the label template for Avery labels. One box of labels lasts for years. If it’s a busy year, we will do the cards between Christmas and New Years, when there is time to relax and enjoy it. Everyone gets a personal signature and often a few words on their card. It takes time, but it’s fun. I say, do what you want. Do New Year’s cards, do e cards, do no cards at all! Whatever works. One year we got a Valentine’s card instead of a holiday card. They’re all welcome. Also, I used to use them to decorate a ribbon hung across a wide doorway. Now I put them in a basket. After the holidays, I really enjoy sitting down and re-reading them with my DH. I agree that making a list of what is really important to your family each year is very helpful. Don’t get frazzled. The point is to enjoy things and make happy memories. Not to be perfect or be your mother. Life goes fast, kids grow up fast, so enjoy!